Most of you are tired of seeing the green sorceress constantly fighting Blue Bolt. Hereafter, this strip will be improved by showing new and more exciting action without the green sorceress. Blue Bolt would continue but without Simon and Kirby. 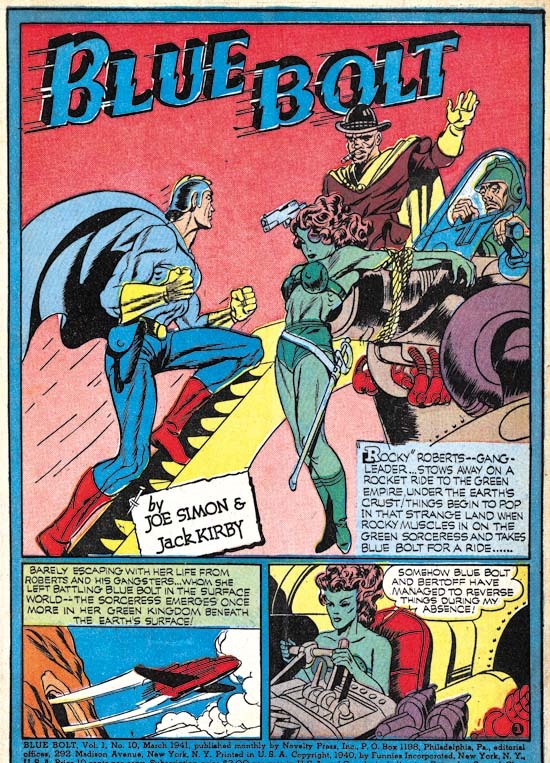 While Kirby is usually credited with drawing Captain America, some of it was actually penciled by Simon particularly in the first issue. 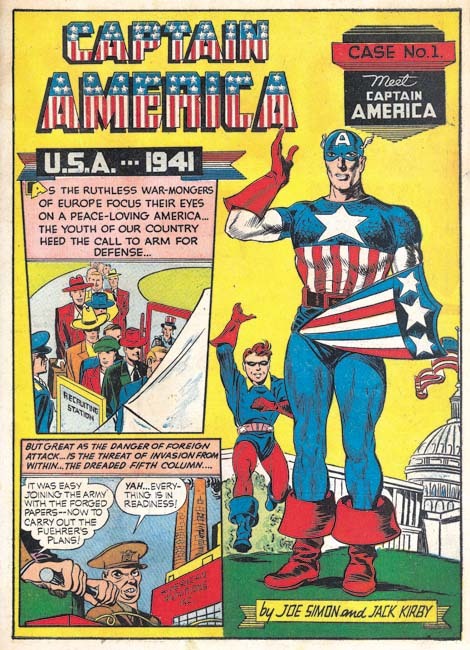 For instance the standing figure of Captain America shown above was drawn by Joe while the rest of the page, including the running Bucky, were done by Kirby. In a previous post (Chapter 10) it was observed that Simon and Kirby had begun using some new layout devices. One, picked up from Lou Fine, was to extend figures beyond the panel borders. If anything, Joe and Jack made even greater use of this device in Captain America. Sometimes to extremes as for instance the standing Bucky in the upper left of the page shown above whose figure extends over three panels. In Captain America Simon and Kirby began using unusually shaped panels as well such as the circular panel and others with a curved border shown above. Even Ferguson got into the act by using vertical letters for normal text in the speech balloons while using slanted letters in captions and when emphasis was desired. It appears that Simon and Kirby were doing whatever they could to make Captain America art stand out. While all the Captain America stories from the first issue were drawn by both Kirby and Simon, inked by various hands and lettered by Howard Ferguson there were two backup features that were drawn, inked and lettered by Kirby alone. That is not to say that Simon was not involved just that there is no evidence to prove he was. 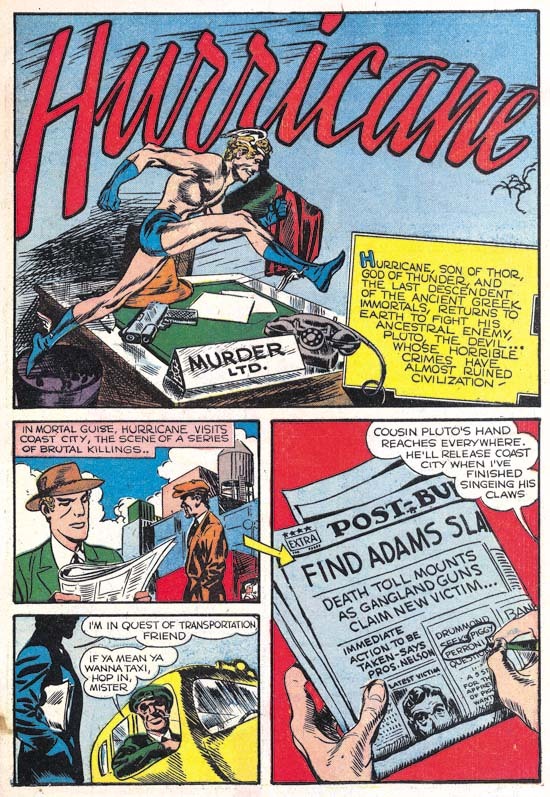 One feature, Hurricane, concerned the return of the god Mercury to the human sphere. As such it was the first Kirby piece with a mythological theme. 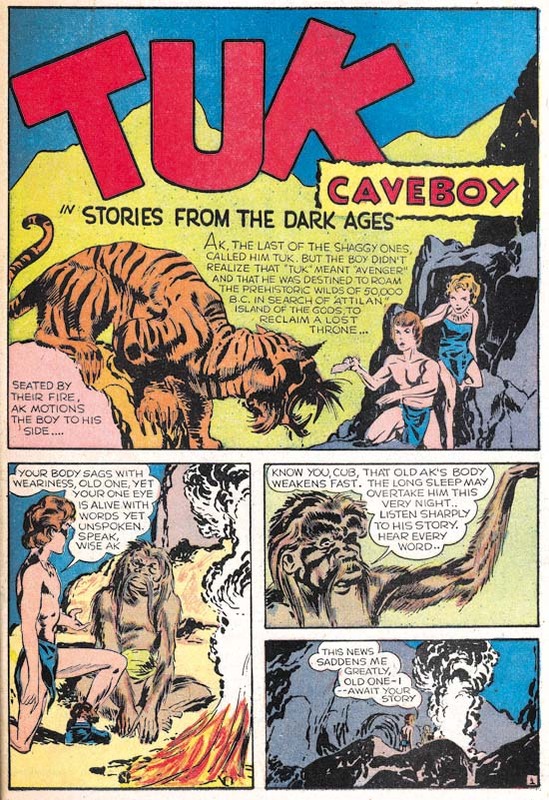 The other all Kirby piece was Tuk Caveboy. 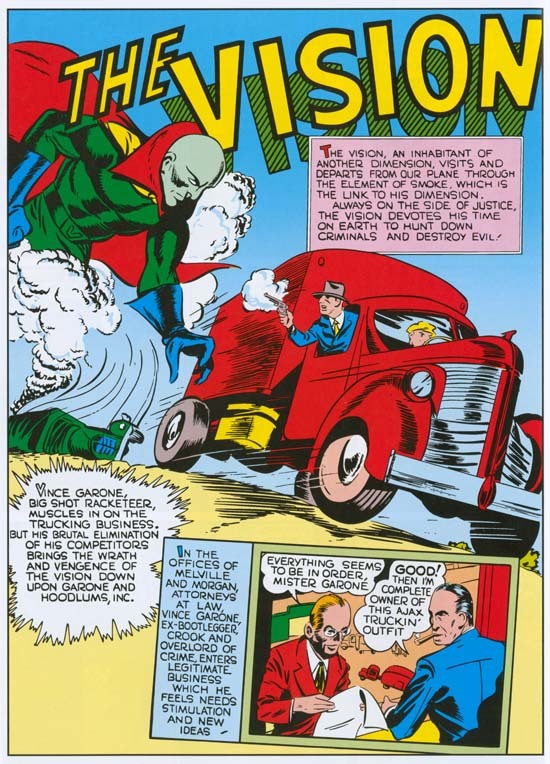 Kirby also drew and inked the Vision story for Marvel Mystery #17 but, as with the previous issue, he did not do the lettering. Captain America was a break through comic for Simon and Kirby, particularly for Kirby. Simon’s Blue Bolt had been an important enough of a creation to be the featured story of a new comic book title with the same name. It probably was popular enough but nowhere near as big a seller as Captain America. Up until then none of Kirby’s comics received any real attention. Captain America changed all that and made Simon and Kirby a brand name. While somewhat primitive compared to what Simon and Kirby would produce even a single year later, Captain America was well advanced relative to the comics published at that time. Pretty much everyone noticed and the comic book industry was changed forever. It would be a great story to say that when Simon met Kirby they shortly began their classic collaboration. A great story but not what actually happened. Instead what appeared to occur was a variety of working conditions. 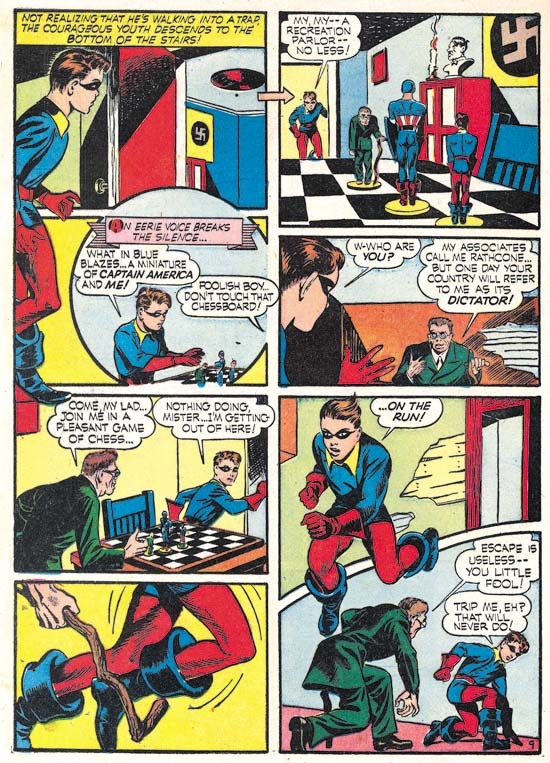 Sometimes Jack helped out with some pages of art (for instance Blue Bolt #2 and #3), sometimes Kirby would do the pencils and Simon the inking (Blue Bolt #4 to #7), sometimes Kirby would do the pencils and other the inking (Blue Bolt #8 and #9), occasionally both Joe and Jack would pencil and others would do the inking (Captain America #1) and finally both might do their own individual projects (like Simon’s Fiery Mask in the Human Torch #2(1) and Kirby’s Vision stories in Marvel Mystery #13 to #15). While the overall tendency was for greater dependency on Kirby’s undeniable artistic skills as time went on, what appears to be happening was Simon taking on the roll of a true or acting editor using Kirby (or not) in whatever combination needed to get the job done. In my opinion it was not until Simon and Kirby left Timely for DC that they began to truly forge their business and artistic collaboration. So ends another serial post. I am sure that someday I will do one on Joe and Jack’s Captain America but that day is not today.